Ignore it all you like, but eSports is booming. There are now million-dollar payouts, doping scandals and even official ways to put money down on your favourite squad. 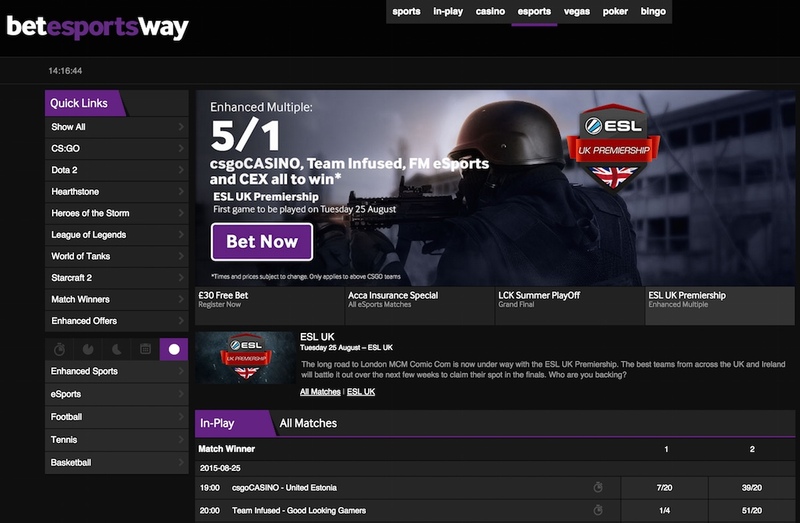 While gambling on eSports is still a relatively new concept, it's just been given a much-needed boost after well-known UK betting site Betway launched its very own gaming portal. The company, which has traditionally focused on football, horse racing, tennis and other "traditional" sports, believes it's the first major bookmaker to expand into competitive gaming. A quick look at the Betway site shows bets for all the major games you'd expect: League of Legends, Dota 2, CS:Go, Starcraft 2, Hearthstone, FIFA and World of Tanks are all present, as well as individual matches from tournaments hosted by ESL and other event organisers. There are also some fun special bets, which include 99/1 odds on Hearthstone becoming part of the Winter Olympics in 2030, giving plenty of time to think about what you'd do with your (unlikely) winnings.